Is there really anything new to say about Lenin? After seventy years of Communist propaganda and twenty years of something close to the opposite, surely we know everything there is to know about the man and his politics? This book will cause many readers to revise that opinion. I say “many” readers will change their minds, because not everyone will accept Dr Felshtinsky’s theories. He is a classic Russian conspiracy addict, they might say, pointing to the fact that he was the co-author of the book, Blowing Up Russia, with Alexander Litvinenko, who was famously “nuked” in London five years ago. As far as I know, Dr Felshtinsky has not been attacked in any way, and indeed appeared last year on my radio programme on the Voice of Russia without raising any eyebrows, when he talked about his previous book The KGB Plays Chess. Partly because I have talked to him and read that book, I am prepared to give credence to his theories. And it is important to stress that he puts forward many of them as ideas which best fit the facts, rather than as definite, incontrovertible conclusions. So what is he actually saying? It is really very simple: Lenin and his gang—and I use that word advisedly—were first and foremost criminals. Their only interest was in taking power in Russia, by any means possible. They were prepared to betray any ideal, confidence or trust, and kill any friend, comrade or innocent bystander if to do so helped them trample their way to supreme power and, once there, to enjoy its fruits without any scrutiny from their fellow citizens—who might more accurately have been called their servants. Felshtinsky starts with the story of Savva Morozov, the liberal industrialist who was one of the Bolsheviks’ secret supporters in the 1900s. He gave them immense sums of money, as he did to their newspaper, Iskra, and to the Moscow Arts Theatre in order to stage Gorky’s subversive plays. But when Morozov’s mother, who officially owned the firm, cut him out of the cash stream, he took out a life insurance policy in favour of Gorky’s wife (who had been his lover) knowing that she would give the money to the Bolsheviks. Almost as soon as he had signed the policy, he was murdered, and the Bolsheviks collected the 100,000 roubles, a huge sum of money in 1906. A similar fate befell another idealistic young factory owner, Nikolai Schmidt, who was related to the Morozovs. And they were not the only victims. Felshtinsky ends his story twenty years later with Lenin’s death. Stalin once said that he was only Lenin’s pupil. In one sense, he was right. Lenin created the Bolshevik organisation and that organisation created Stalin. The Great Terror in the 1930s was not an aberration, as many Western apologists for Communism like to say, it was inherent in the methods by which Lenin established the state which carried it out. The Bolsheviks came to power with the aid of the Kaiser’s government who, according to one of His Imperial Majesty’s finance ministers, gave them about 50 million gold Marks, worth about £2.5 million. (For comparison, the revolutionary battleship, HMS Dreadnought, cost £1.8 million in 1906.) Little information has survived about these deals, mainly because, post-War, the Germans wanted to cover their tracks after seeing what use Lenin had made of their money. And of course, Bolshevik archives have been “cleansed”. Though the details of the co-operation are unknown, one fact appears unarguable. At the time of the Brest- Litovsk peace in March 1918, which gave Germany everything it wanted in Eastern Europe and cost Russia roughly a third of its resources and population, the opinion of communists everywhere, both in Germany and in Russia, was that this would destroy the chances of world revolution, which all thought would start in Germany. But Lenin was not interested in world revolution, only in securing power for himself and his clique. This was just what the Kaiser wanted. Lenin used the controversy over Brest- Litovsk to destroy the so-called Left Communists and the Social Revolutionists and create a one-party state which employed terror as its main weapon for retaining power. There is massively more to this story than that, including Dzerzhinsky’s attempt to murder Lenin in August 1918, Soviet involvement in the murder of Germany’s leading Communists, Karl Liebknecht and Rosa Luxemburg, in 1919, and Stalin’s involvement in Lenin’s apparently untimely death. It appears that came about as part of a coup against the leader, led by Sverdlov, who was subsequently killed by Stalin, because he coveted his power as General- Secretary of the Communist Party. 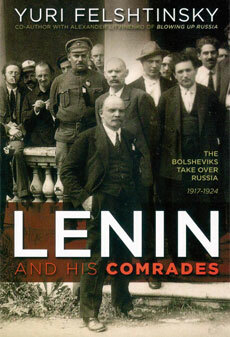 Lenin’s poisonous hatred for every aspect of the Tsarist regime, and everyone who disagreed with him on any political issue, as well as his complete mistrust of all his colleagues except Trotsky (which is why Stalin had to get rid of him), left a legacy of almost psychotic cynicism and violence which ensured that honesty, freedom and political idealism could not survive under Communism. The existence of a free world outside Russia meant that Marxism-Leninism had to compete in an evolving world in which innovation and free experiment were necessary for survival. Lenin said that in the long run communism and capitalism could never co-exist. He was right. But it was not Ronald Reagan, Mrs Thatcher or even Mikhail Gorbachev who killed the communist ideal, it was Lenin and his comrades.